David Cronenberg's latest drama will analyze Blu-ray next month. 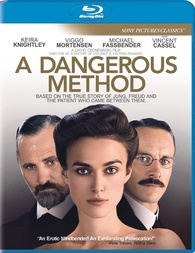 In an early announcement to retailers, Sony has slated 'A Dangerous Method' for Blu-ray on March 27. The film centers around the disintegrating relationship between Sigmund Freud (Viggo Mortensen) and Carl Jung (Michael Fassbender) as they treat a disturbed young woman (Keira Knightly). The Blu-ray will feature 1080p video, a DTS-HD Master Audio 5.1 soundtrack, and supplements include: Commentary with David Cronenberg, The Making of A Dangerous Method featurette com and AFI's Harold Lloyd Master Seminar with David Cronenberg. You can find the latest specs for 'A Dangerous Method' linked from our Blu-ray Release Schedule, where it's indexed under March 27.